Virginia “Ginny” Haerr, 66, of Lakeview, passed away at 10:36 a.m. Saturday, Nov. 17, 2018 at Heartland of Bellefontaine surrounded by her loved ones. She was born in Bellefontaine on Sept. 24, 1952, to the late Robert L. and Bessie M. Linkinhoker Millner. Ginny is preceded in death by her brothers-in-law; Avit Schwieterman and John Amrine and stepson, Jeff Haerr. Ginny is survived by the love of her life, Allan Haerr, who she married on July 8, 1995, her three children, Shawn (Kishya) Maddox of Springfield, Scott (Stacey) Maddox of San Antonio, and Shannon (Bill) Henderson of Bellefontaine; four stepchildren; Steve (Jodi) Haerr, Rob Haerr, Jimmy (Alice) Haerr, and Allan (Cynthia) Haerr, Jr., all of Springfield. She has numerous grandchildren, great-grandchildren, nieces and nephews, and two sisters, Nancy Schwieterman, of Lakeview; Kathy Amrine and her friend, Doug Barker of Marysville. Ginny is a 1971 graduate of Indian Lake High School. She was a loving wife, mother, grandmother, sister and friend. 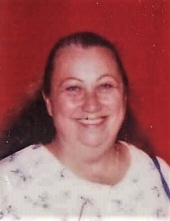 She enjoyed bowling, fishing, sewing, cooking, going to flea markets and spending time with family and friends. Ginny was a kind and gentle person who placed the needs of others above her own. Her personality and sense of humor brightened any room she was in. She will be missed dearly. Funeral services begin at 2:00 p.m. Tuesday, Nov. 20, 2018 at Shoffstall Funeral Home, 205 S. Main St., Lakeview with visitation from 12-2. Burial is in Highland Memorial Cemetery, West Liberty, Ohio. In lieu of flowers, the family requests donations be made in Ginny’s memory to Heartland of Bellefontaine. Arrangements are in the care of Shoffstall Funeral Home. Condolences may be expressed at shoffstallfuneralhome.com. To send flowers or a remembrance gift to the family of Ginny K. Haerr, please visit our Tribute Store. "Email Address" would like to share the life celebration of Ginny K. Haerr. Click on the "link" to go to share a favorite memory or leave a condolence message for the family.